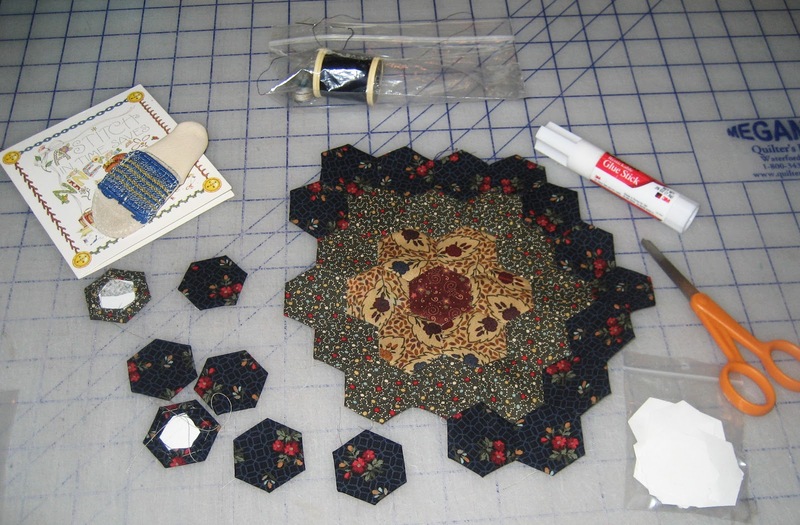 When I recently needed a project for a car trip, I pulled out a small kit for an English paper-pieced Grandmother’s Flower Garden block. I remembered Rachel Wetzler’s article “Portable Pastime” in the May 2009 issue of American Quilter magazine on preparing just such a project. Rachel recommends printing the templates on freezer paper, then pressing the shiny side to the wrong side of the fabric before basting around the templates. But there was no time for that—I already had lightweight cardboard templates, and my husband was in the car and ready to go. So I grabbed my re-stickable glue stick and was out the door. The glue stick worked great. Re-stickable (sometimes call removeable or repositionable) glue stick makes any piece of paper stick like a Post-it® note. It holds the paper in place but is easy to remove without leaving sticky residue. I like the Scotch® brand but Avery® and Elmer’s® make comparable products. Rather than pin the templates to the fabric, I applied a light coat of the re-stickable glue stick to the back of the template. I let it dry about a minute, then finger pressed it onto my fabric. It held firmly while I basted around the template. When it was time to remove the template it came out easily and the template could be reused. Restickable glue stick has become an important tool for my quilting. I have used it for years to hold the first patch to the foundation when foundation piecing. I also apply it to the back of plastic templates to hold them in place on fabric while I draw or cut around. If you decide to give this a try, make sure you are using re-stickable (or removeable or repositionable) glue stick, and apply it to the template or paper—NOT the fabric.